Darwin identified at least two triggers of evolution: either shocks that hit a system from the outside or ‘mutant’ shocks that sprout up from within a system. 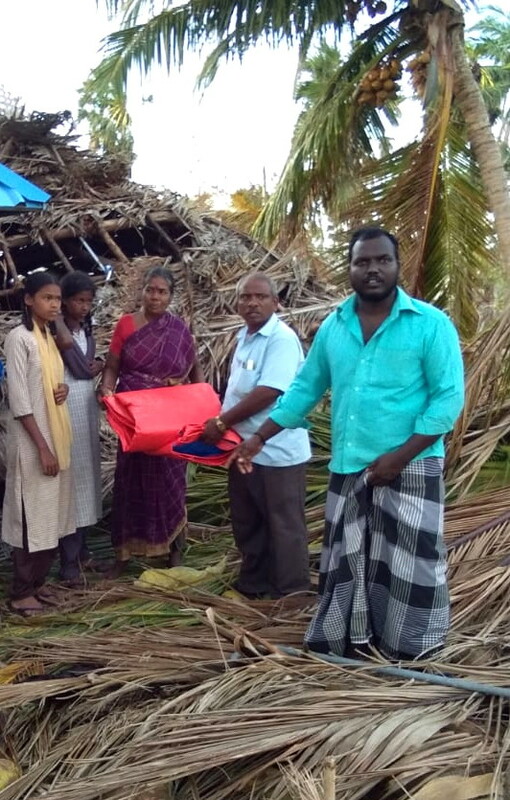 The Gaja cyclone that hit the coastal areas of Tamil Nadu state in India on Friday 16 November 2018 is a typical example of the former, while the human cylone, wearing bright yellow vests, or the gilets jaunes, which stormed out on the streets of Paris and elsewhere in France on Saturday November 17 can be considered the latter. Though worlds apart, these two shocks have parallels worth noting. Cyclones like Gaja emerge unpredictably over tropical oceans, as a function of the temperature and moisture prevalent, but once formed, they can be tracked. Gaja was a category 3 storm like Katrina in the USA. In contrast, although the initial reasons for the formation of gilets jaunes were clear, namely discontent over announced fuel taxes, their evolutionary trajectory was unpredictable. When shocks occur in the system, there can be winners, losers, bandwagon effects, new shared value or collateral damage leading to new perceptions for all actors on what they can do for themselves and the impact such actions can have on others within the system. Today, the first winners seem to be the gilets jaunes in France and the biggest losers are the fishermen, farmers and the poor of Tamil Nadu. But, there is more to this. Winners are those who clearly recognise and exploit the windows of opportunity opened up by a shock. However, their success might trigger both wanted and unwanted imitators jumping on the bandwagon. For instance, after the first manifestation of the gilets jaunes, once their group identity was largely acknowledged, they were joined by many others, nursing a variety of grievances, including a few hooligans. The group’s raison-d’être is extolled by some political parties, which while not offering a clear alternative plan for the highlighted problems, nevertheless recognise it as an opportunity to increase their voter base. Returning to the Gaja cyclone, not all villages suffered similarly. The Tamil Nadu government and media outlets had given a lot of warnings. Some villages underestimated the risk, while others girded themselves for the danger. However, this is not being highlighted much because of the competition for relief funding – in other words, households are given incentives to highlight the damage suffered rather than precautions adopted. The collateral damage in France and India by these shocks has had different systemic impacts. In France, there were two accidental deaths and the national monument, the Arc de Triomphe was damaged, as well as luxury cars and shops along the Champs-Elysées. According to the Bank of France, the consequent losses in terms of lower employment and business activity, is around €4.4 billion. In Tamil Nadu, besides the enormous direct damage inflicted by the cyclone, the consequent relief operations attracted minor criminality. For example, a company sent a truck full of relief materials to my NGO, but it was stopped along the road to Kameshwaram and all relief materials were stolen. Whose responsibility is it to ensure systemic recovery from shocks? This mantle falls usually upon the State. But, it is far from clear whether this would be indeed possible for any one actor, including the government to ensure recovery with social justice. President Macron in his New Year address evoked artificial intelligence among the important driving forces that are going to shape the French economy. To what extent is the economic disfranchisement of the gilets jaunes indicative of more human cyclones to be formed under the fourth industrial revolution? According to the findings of the latest Intergovernmental Panel on Climate Change, more cyclones and tsunamis are likely. How are governments of poverty-burdened emerging and developing countries going to be able to offer adequate relief after repeated climatic cataclysms? Marx and Schumpeter considered new technology and innovations to be among the prime sources of societal shocks, but while Schumpeter was confident that they would also be part of the solution, Marx indicated that community engagement was key in the long run. I and a number of colleagues think it’s likely to be combination of both. In fact, exploring solution designs to make economies more resilient is probably one of the most exciting research areas today. But combining elements of technology and innovation, with policy and community engagement efforts, leads us away from the notion of a ‘solution’ to that of a ‘solution design’. This will make the economics messy. Modeling and precise impact evaluation may not be possible, but we feel that it’s just the kind of experiment that complex systems need most. 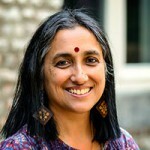 Ramani, Shyama V., ed. 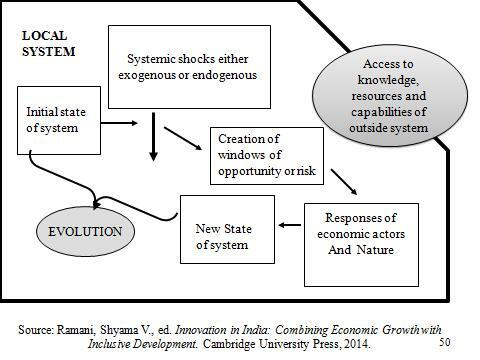 Innovation in India: Combining Economic Growth with Inclusive Development. Cambridge University Press, 2014. Schumpeter, J. (1942). Creative destruction. Capitalism, socialism and democracy, 825, 82-85.